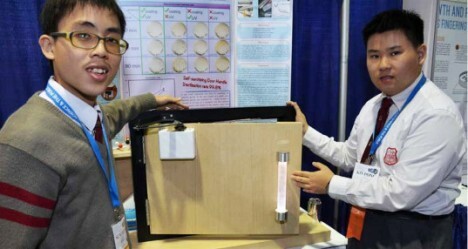 A pair of young inventors in Hong Kong has developed a doorknob-replacing device to change the way we approach hygiene, their prototype successfully eliminating 99.8% of germs on contact using metal and light – a perfect solution for that perpetually tricky question of how best to exit a public restroom. Sun Ming (Simon) Wong and 18-year-old King Pong (Michael) Li built their creation out of relatively straightforward materials: a cheap embedded ultraviolet LED light coupled with bacteria-killing titanium oxide.Even more ingenious, no external power source is required – the kinetic energy of the door’s motion is converted by a power-generating gearbox into the requisite juice to turn on the handle. 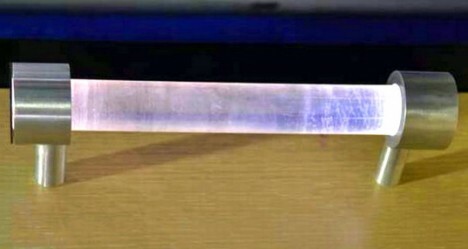 Set inside a clear glass container bracketed by metal, the light activates the titanium oxide and turns on the germ-assassinating machine as you use it, after which it turns back off automatically. While similar processes have been used for a long time to disinfect surfaces, this solution is cheap and can be deployed on a massive scale for everyday use.